Eden Hazard showed what he’s all about this afternoon, as the Belgian combined brilliantly with Olivier Giroud to bag a stunning equaliser for Chelsea against Cardiff City. Hazard has been on fire for the west London side this season despite only starting a few games, and he continued this form this afternoon with a super goal against the Welsh side. 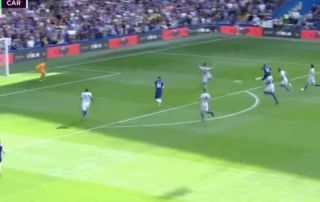 The Belgian sold a fantastic dummy to allow the ball to roll to Giroud before getting the ball back and beating his man, as he slotted home to equalise for Maurizio Sarri’s side. Here’s a clip of Hazard’s goal, what a player he is!